I stayed with my Pinni(Mom's younger sister) and grandma during my entire college days. 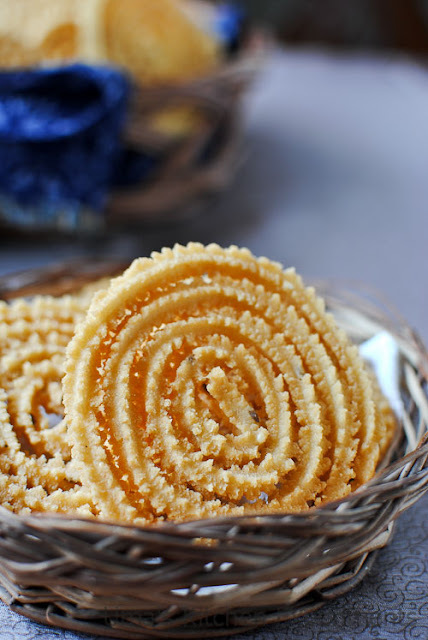 Though I never entered into the kitchen those days, I used to help them whenever they make palakarams (sweets and snacks for festivals like Diwali). Also, My Grandma prepares them in a large quantity to send them to all her daughters. So each member in the family would be participating in someway for making murukku/ seedai/ thattai. Most of the time my job would be pressing murukku or making round shape of thattai or rolling round,tiny balls of seedai. The joy that comes out of making perfect palakaram will never come by doing any other activities. I love to press murukku each time when she prepares it and till now the job is continuing. I always show interest in pressing the murukku rather than showing my interest in making a dough or frying. But I know, for making perfect shape/murukku, the dough consistency is important. So, This time when I prepared it for Diwali, I followed my grandma's instructions carefully for making dough to get perfect murukku. 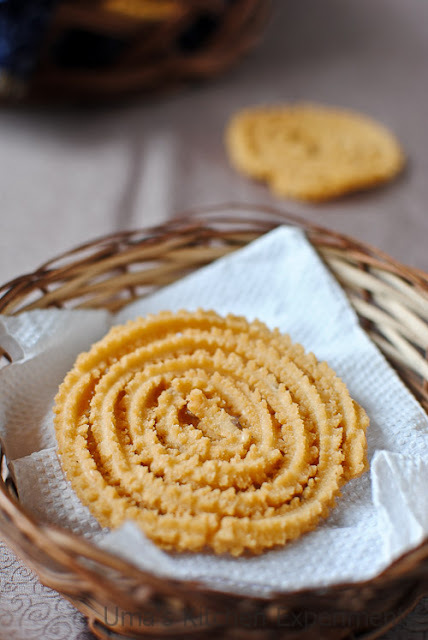 Later, I pressed murukku using a single star nozzle as round shape and fried it. Go ahead to see how it came out for me. 1) Sift the rice flour. In a dry mixer/ blender, make a powder of roasted channa dal. Sift it and measure 1/2 cup which is required for this recipe. 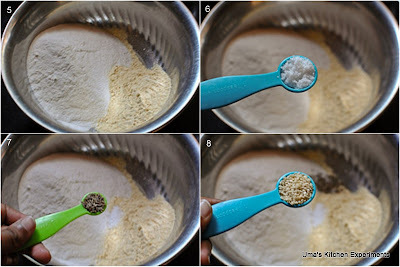 2) In a wide mixing bowl, mix sifted flours and other ingredients except butter and water. 3) Heat water and when it is boiling, add it slowly to the flour mixture. Initially the dough will be in crumble in texture. At that time, add butter. Make a smooth, soft dough. Start mixing initially using a knife and when it comes to warm temperature use your hands to make smooth dough. Divide the dough into equal parts. 4) Heat oil in the thick bottom pan / Kadai. 5) Meanwhile, grease the Murukku maker. 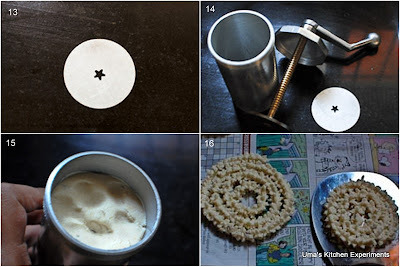 Use a single hole star pattern for perfect round shape or 3 hole star pattern for random shape murukku. 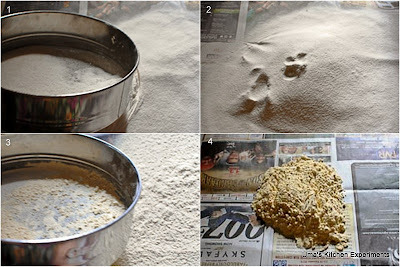 6) Fill the dough to the murukku maker. 7) Press it to a circular motion without taking your hand for perfect round shape on the back of the ladle or wet cloth or news paper. I feel comfortable with pressing it in the news paper. 8) After pressing, slide the murukkus to the hot oil and deep fry them in medium to high flame until the bubbles sound(shh sound) suppresses. At a time you can fry 3-4 or based on the frying pan size. 9) Remove from the oil and put them in a colander to drain the excess oil if any. You can either use kitchen tissue to absorb the excess oil. 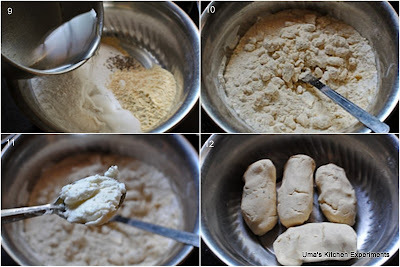 10) Repeat the same procedure for making remaining murukkus. 11) Cool down the murukkus to room temperature and store it in a air tight container. 12) Serve them with hot tea or coffee. 1) I used home made rice four for making this murukku. 2) Add red chilli powder to it for the spicy version. Add more cumin seeds and sesame seeds if preferred. 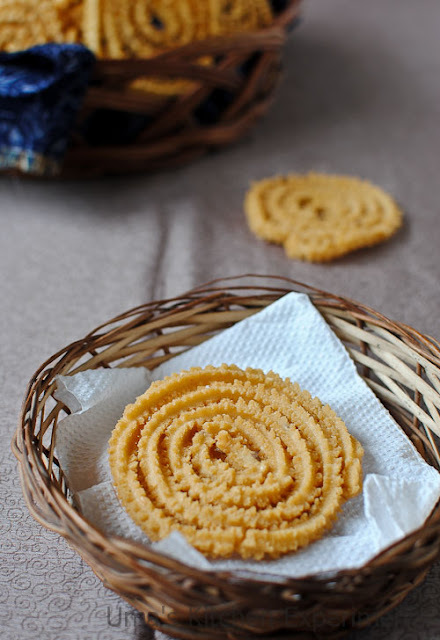 3) After frying the first batch, if the murukkus are hard to bite, then add extra butter or hot oil to the dough for making the next batch. 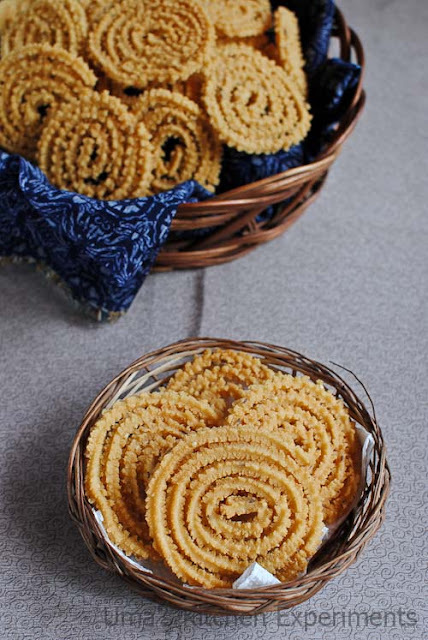 Mullu murukku looks super perfect and love the presentation...Beautiful..
love this mully murukku a lot, perfectly made spirals...well presented! Prefectly squeezed, you have super beautifully Uma,beautiful murukkus.